I am pretty sure I'm developing OCLD: Obsessive Compulsive Laundry Disorder. 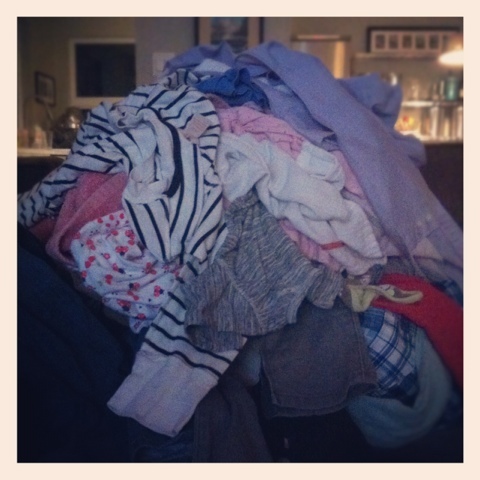 Stemming from the fear that our laundry will get away from us and I'll be faced with a five-load bender, I find myself pulling semi-dirty, like coloured washables from every room in the house just to make up a full load. I happily sort piles and leave them on the the laundry room floor, much to Chris' dismay, and always fold a load before going to bed at night. I do this knowing that another load of diapers is just around the corner. But it hasn't always been like this. Before Eloise arrived Chris and I would let the laundry hamper topple over before giving in and putting on a wash. Having a child and cloth diapering certainly changed this, and now there seems to be no stopping me. The other day Molly suggested that cleaning was my 'hobby'. Hmm. I don't like to think about laundry like that, but there is something about clean clothing that brings me a weird sense of pleasure. And I am pretty much certain that stuffing and folding cloth diapers in front of the tv is basically therapeutic.